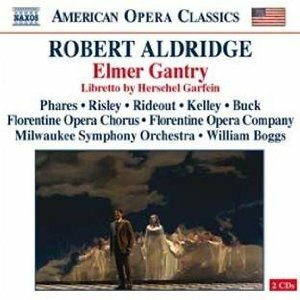 Aldridge: Elmer Gantry | Frank Kelley | Dispeker Artists, Inc.
Set just before World War I, Sinclair Lewis's incendiary novel Elmer Gantry tells a story of old-time religion, illicit romance and revenge. Robert Aldridge and Herschel Garfein's operatic adaptation is a "marvelous amalgam of toe-tapping accessibility" (Opera News) full of hymns, gospel songs, marches, and dance, evoking the period in a score which echoes Gershwin and Copland. This all-American production combines a first-rate cast of singers and a world-class orchestra for "an intoxicating experience" (New York Times).